Burmese culture is an exceptional blend of rice cultivation values and Buddhism ones. In addition, under the influence of many neighboring countries like India and Thailand, the country has absorbed much of cultural quintessence, not to mention Western culture, which also entered Myanmar more than a century ago. A Myanmar trip will help you better understand the cultural richness of the country of Golden Temples. Like other countries in the region, Myanmar shares partly its border with China. However, despite a strong presence of the Chinese community, Burma hardly receives the influence of traditional Chinese culture. Indeed, the country has its own agricultural calendar (lunar). Its 7 astrological signs are thus different from those of Chinese astrology. Confucian ideology, writing, classical literature as well as music, customs and other culture values of China hardly exist in Myanmar. The Ministry of Culture of Myanmar is responsible for the management of all cultural activities, literature, arts, museums and publishing. The literature of Myanmar is deeply influenced by the philosophy of Buddhism. The first literary works of Myanmar, which were mainly religious works, were carved in stone at the time when Buddhism was not yet a dominant religion in the country. Since the 15th century, new manuscripts have appeared in Myanmar on palm leaves. The contents of the literary works of this period were mainly related to the stories told by the Buddha and in which he answered the questions of the faithful, often expressed in plays or poetry. Religious or historical works are written in prose. Myanmar's classical literature has flourished in two major periods. The first period lasted 300 years, between 1450 and 1750. A kind of verse (called Pyo) and 4 kind of poetry (called Mongun, Eigyin, Tola, Yadu) were born. The main topics are stories about Buddhism or stories praising kings and their royal families. They also talk about military campaigns and beautiful landscapes. The second period began in 1750 with the appearance of another epic genre (called Yagan) that tells Mon legends, Indian legends and singing poetry (called Bole). They were composed and interpreted only at the request of the royal family. Myanmar's classical literature, usually written in a sophisticated style, tells mystical stories from the monarch's palace. After the invasion of Thailand in 1767, Thai plays and novels were introduced in Myanmar. They contributed to the development of the Burmese literature. Since Myanmar fell under British rule, the country's literature is strongly influenced by Western culture. The import of printing technology also affected the Burmese literature. It is thanks to printing technology that plays gained popularity among the public. Paper could not only watch them on stage, but also read them on paper. Myanmar's first novel is an adaptation of a novel by Alexandre Dumas - "The Count of Monte Cristo" in the context of Myanmar. The modern literature of Myanmar has formed since 1930s, after the founding of Yangon University. A new trend in literature - called the Khitsan (contemporary) phenomenon has emerged. The authors use a simple, clear literary style and this style continues to prevail in Myanmar today. The modern literature of Myanmar is still popular with religious works. At the same time, there are many novels, poems, stories for children and works translated from foreign literature. Most famous novels are romance novels and novels of kung fu. Literary prices are awarded annually in Myanmar. Many famous writers are retired officers. Some have taught at the university. Most authors consider writing as an additional job. They write only during their free time. The literature of Myanmar is strongly influenced by the orthodoxy of Buddhism. Buddhism forbids fictitious stories. However, British colonization brought to Myanmar kinds of fiction that have become so popular today. The poetry of Myanmar is very unique and has many genres. The people of Myanmar enjoy watching the popular theater called Zat. These stories tell of Buddha's previous life and how he met his disciples, parents and enemies. These stories illustrate heroic deeds, the wisdom and courage of the Buddha before he attained enlightenment. The Zat is often played all night and interspersed with the performance of dancers on stage or musicians behind the scenes. The Zat is played on a Zat-Yone - a large bamboo stage or simply surrounded by a bamboo bed sheet. The audience is sitting on mats to watch the show. They can bring food, cigarettes and other things to chew while watching the show. The Zat generally begins around midnight and ends at dawn. Before the show is an interpretation of dancers. Another kind of theater is also very popular in Myanmar called Yamazat - a version of the epic Amayana style of Myanmar. The actors wear masks to play the main characters like princes Yama and Lekkhana, princess Thida, witch, monkey king and baby monkeys. In early 16th century, after the Thai conquest of King Hsinbyushin in 1767, many Thai artists and musicians remained in Myanmar. The traditional theater of Thailand was introduced in Myanmar. A genre named "Lakhonnai" - meaning "palace" in Thai, were composed and made for the king and the governor. From the sixteenth century to the end of the eighteenth century, the traditional theater was popular in Myanmar. In the nineteenth century, traditional theater was in competition with other types of arts, especially those of the West. The puppet theater has existed since the time of King Nga Sint Gu Min (mid-seventeenth century to the end of the eighteenth century). An officer devoted to the entertainment of the royal family called U-Thaw is considered the pioneer of this theater category. In the feudal society of Myanmar, social relations between men and women were very limited in public places. This has inspired the use of puppets in place of performers and the puppet theater has had the opportunity to develop. The use of puppets in Myanmar requires ingenious control. Some of the puppets have six strings to control. Some puppets can even blink. A puppet play requires twenty-eight characters: a king, an old woman, a prince, a princess, an astrologer, a loner, a Nat (spirit), a Mahadeva (god), an old man, two Clowns, two Catholics, a horse, two elephants (a black and a white), a tiger, a monkey, two parrots, a dragon, a witch and four assistants. Artists control the puppets while men and women use their voices to tell the story. Today, the puppet theater has almost disappeared in Myanmar. The emergence of different types of other arts has taken audience from the puppet theater. When old artists pass away, it is very difficult to find successors. Currently, the puppet theater appears only in some festivals of ancient temples or on big Burma holidays. The dance in Myanmar began in the Buddhist era when the cult of Nat asked for accompanying dance. The dances of Myanmar are very lively and ask artists to perform difficult movements. They are also very elegant with sophisticated costumes, and dancers never touch each other. Beginners in dance are taught Kabyalut - a basic traditional dance of Myanmar. There is a very interesting dance in which the dancers make movements like puppets. This is why it is said that Burmese dance is an imitation of the puppet theater, a theatrical genre that puppets can replace real dancers. The female dancers wear royal clothes: jacket with long and wide sleeves and a Longyi. The male dancers are dressed in longyi silk, white jacket and scarf. Other dancer roles include soldiers, Zawgyi (shaman) and Nat. Yein is the famous dance of the annual Myanmar Water Festival whose dancers, often women, wear the same costumes and perform the same movements. Hnaparthwa is a dance of a duet of two women or a man and a woman. Elephant Festivals are held in mountainous areas with the team of dancers in the effigies of cardboard elephants. The popular Anyein dances are simple dances combined with the Lupyetxen clown that makes the audience laugh, taunting current events and other subjects, including profane ones. When the clown is on stage, it’s the time for dancers to rest or change their costumes. The entire dance lasts about two hours. Many ethnic minority dances are performed with swords or small and large drums. Dances of ethnic minorities are often performed in which men and women dance together. A traditional Myanmar classical orchestra is a set of musical instruments consisting of drums, gongs, cymbals, bells, flutes and trumpets. All their sounds form a unique type of music in Myanmar. Under the Hsinbyushin dynasty of Burma, the king invaded Thailand in the eighteenth century. Many musicians, dancers, Siam musicians were arrested and taken to Burma. As a result, the music and culture of Burma were greatly influenced by the culture of Siam. There is a type of dance and classical lyrics called Yodaya, which means "the people of Siam". Today, Western instruments such as violin, piano, mandolin, guitar and accordion also participate in the Myanmar orchestra. A traditional Myanmar orchestra usually consists of a set of drums, a gong, bells and wind instruments, including the high-pitched sound, flutes and cymbals. In a drum kit, there is a large drum hanging on brackets engraved with flying dragons. Gongs and drums are decorated with colored stripes and mosaics made of glass or gold on drums. The drum can be disassembled to be carried everywhere. A large drum kit has 21 units, while the small one has only 9 drums. Sometimes instead of the gong, a quadrangular is used which consists of a set of gongs hung on a rectangular frame and some round gongs. In rituals, people use different types of drums: Sidaw - large drum - used for big occasions; OZL - amphora-shaped drum - and Dobat - tambourine - used for village festivals; Bonshay - long drum - and Bongyi - drum - used in seasonal festivals. A Burmese drum can change its sound by applying a handful of sticky rice mixing with ash to the bottom of the drum. A drum kit can thus play varied songs because they have many different tones. The Saung-gauk of Myanmar is a very popular ethnic zither with 13 strings, shaped like a boat. During his performance, the musician sits on the floor and keeps the instrument on his lap. The Puttalar is a xylophone made of wood or bamboo. The musical instruments of ethnic minorities are very varied with many forms and materials. The Chin have a trumpet resembling the OBOA, called Bühne. Mon gongs are hung on a horseshoe mount. The Karen’s flute is composed of bamboo tubes of different lengths, attached in the form of a triangle. A popular theater in Myanmar is called Pya-Zat (Pya means "show" and Zat is "story"). The Pya-Zat is quite similar to modern music show with many simple scenes, but unlike the western music show, the Pya-Zat has no scene of dance and singing. It usually presents poem recitation. A scene of Pya-Zat often begins with a mime, as a "silent film" performed by the artists on stage. This show was very popular before the Second World War and after the Independence of Myanmar. However, since the late 1950s, this theater has gradually disappeared with the advent of cinema. In 1943, a number of European style theaters were built in Yangon. During the period between 1943 and 1969, more than 200 plays were performed in these theaters with musical orchestra under the stage. At present, with the support of the State, the Pya-Zat is reborn in order to please the whole population. Compared to other arts of Myanmar, painting holds a special place. Myanmar's traditional painting still preserves beautiful paintings of the Buddha and his disciples, and paintings of temples, monks and nuns, festivals, etc. The modern art of Myanmar is also very well known for its oil paintings, especially the type of colorful paints made by scraping a knife on the wooden surface. The paintings of Myanmar are highly valued in the world of international art and the price of these paintings is often very high. Currently, in Myanmar, artisans can still live comfortably even if the country is in the process of industrialization. The handicrafts of Myanmar such as weaving, lacquer, gold, silver, wood and stone carving, ivory, mother-of-pearl, boat manufacture or even ceramics are still very flourishing. The men and women of Myanmar still prefer to wear Longyi silk or cotton woven by hand even though young people like to dress in western clothes. The Arakan region is famous for weaving Longyi with Acheik patterns bearing magnificent spirals. Regions like Mandalay, Amarapura and Moulmein are also famous for weaving while Mudon near Moulmein is also famous for weaving blankets and tablecloths. Popular handicraft textile products include scarves and blankets in Pakkoku - north of Myanmar. The tapestries, called Kalagar by Western tourists, are very popular. They are velvet or fabric combined with beads. Traditional motifs are often in the form of a dancer, peacocks, elephants and mythical mascots. The gold made in Mandalay is encrusted on the surface of temple towers and Buddha statues as a form of worship. The yellow metal is stuck on a piece of wood to make the gold become thin, then it is cut, packed and sold in stands around the temples for the pilgrims. Burmese women often wear gold jewelry or precious stones that are considered a money reserve. In each city, people can easily find a jeweler. Women come for the purchase and renovation of jewelry. Myanmar silverware is also a famous art. Burmese women usually wear belts, silver necklaces. Bowls, spoons, silver forks are often used in weddings and parties. The pottery of Myanmar includes objects such as pots, jars of water, vases, porcelain pitchers, vases, bowls and other pottery arts. Crafts are mainly related to religion, such as Buddha statues made of precious stones, wood, copper or silver. Stone statues are made in Mandalay; copper or silver statues are made in Ywataung near Mandalay. Myanmar fascinates tourists with its rich culture. The influence of the dominant religion, Buddhism, also brings a typical characteristic to the Burmese culture. 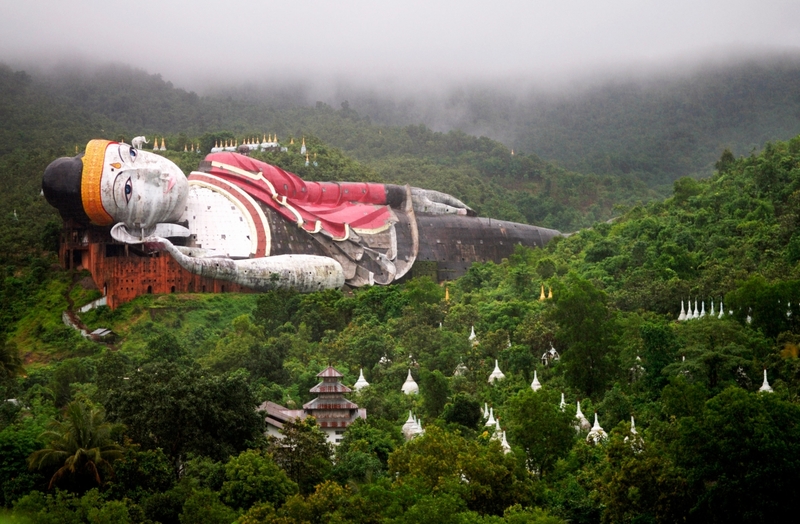 A trip to Myanmar will offer you the opportunity to discover exceptional historical cultural values. Some values are disappearing while others are preciously preserved by the Burmese. Come to understand why the Burmese culture is the pride of all Burmese people.